Compact, reasonably priced 3-channel / 4-channel computer pistol-grip system exploiting 2.4 GHz Frequency Hopping transmission technology, designed for the demanding operator. In addition to three separate control channels and a method of controlling a fourth servo for a separate front wheel brake the system offers a Crawler function for Trials vehicles. This term refers to a mixer function for four-wheel steering. Depending on the model´s requirements, the front and rear axles can be steered separately, together, in the same or opposite directions. 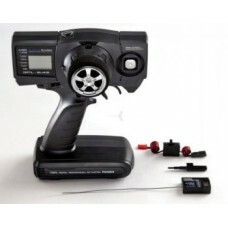 - Servo reverse, steering, throttle, 3rd + 4th channels. -Integral charge socket for easy conversion to rechargeable batteries. The compact R2004GF 2.4 GHz receiver included in the set is ideal for use in RC model cars and boats. 2.4 GHz technology makes the system virtually immune to radio interference and general background interference in model cars.